More often than not, when Iâ€™m eating a chocolate bar, itâ€™s a regular Hershey bar. As a chocolate enthusiast, Iâ€™ve been yearning for the fancy Lindt bars at the grocery store, and what better excuse to put one in my buggy than as my first review for Candy Addict? When I got home with my treat, I locked myself away to enjoy the chocolate without interruptions of â€œMom, sheâ€™s hitting me!â€ or â€œMom, whereâ€™s my favorite pair of skinny jeans? 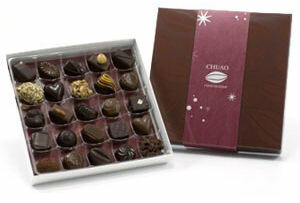 !â€ This was the perfect day for a review of chocolate. Momma needed a moment alone for a quick endorphin fix. I have been a fan of Chuao for a while, but the shipping charge to get their product to the East Coast is fairly mind-boggling. Fortunately, I have a friend in Southern California who couldn’t think of anything else to buy me for Christmas. You’ve read about Chuao here before, but these folks don’t rest on their laurels, and are always coming up with new fillings. The little flier that comes with the box of chocolate asserts that they are “unusual” and “unexpected,” and I am interested in pushing the boundaries of the usual bonbon fillings. I was afraid, though, that they’d gone a little too far with a couple of these. One of them turned out to actually be OK, but the other – well, I will leave that for the end, because a little suspense is a good thing, right? As I have mentioned before, I frequently make deliveries to various businesses in downtown Austin for work. One of the interesting things about it this time of year is that the lobbies of these hotels, offices, and skyscrapers are littered with merchants. Itâ€™s like a mini-bazaar of people selling jewelry, candles, and clothing as convenient holiday gifts. None of these things really pique my interest, and I normally just brush right past them. However, on a recent trip to the twenty-second floor of 301 Congress, one little table caught my eye. It was a display of artisan chocolates. I hurried to the elevator to make my delivery so that I could quickly come back down and review the products for sale. Upon my return, I noticed a stunning collection. There were molded chocolates designed for Christmas and wine bottles matched with wine glasses that were both decorated in a chocolate coating so that you could enjoy a drink and nibble on some Belgian chocolate concurrently. But the highlight of the table by far proved to be a series of molded chocolates that were depictions of paintings. After my review of Tropical LifeSavers, loyal Candy Addict reader, KK, left a comment in regards to my dilemma about being unable to find candy with an accurate mango taste. She recommended that I try Lucas Mango lollipops. My local H.E.B. carries an assortment of Mexican candy, and though they do stock Lucas products, this specific lollipop was not available for purchase. 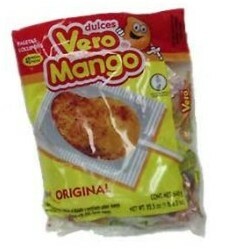 I did, however, spot a similar confection called Vero Mango. Vero Mango, like the Lucas version, is a mango-flavored lollipop that is dusted in a red sheath of chili. I am not really a big consumer of foreign candy that doesnâ€™t come from European, Israeli, or Antipodean origins, so I thought this recommendation might be a nice step into the waters of the Mexican and Latin American candy world.